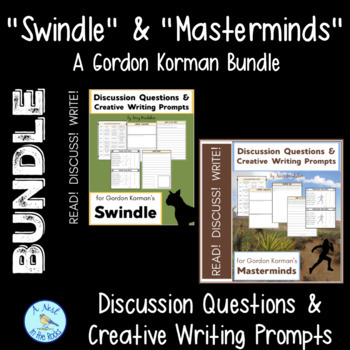 Discussion Questions & Creative Writing Prompts for "Swindle" & "Masterminds"
Discussion Questions & Creative Writing Prompts for Gordon Korman's "Swindle"
Discussion Questions & Creative Writing Prompts for Korman's "Masterminds"
This is a bundle of two Gordon Korman products: discussion questions and creative writing projects for his two middle-grade novels "Swindle" and "Masterminds." Each one contains discussion questions by chapter. The discussion questions are purposely open-ended and subject to opinion to encourage debate and discussion in your classroom. 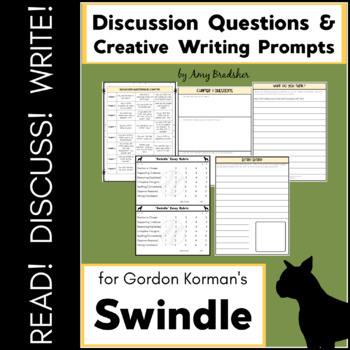 These questions are also reformatted as printable handouts by chapter that can be used as homework, for assessment, or preparation for group discussion. This product also contains essay and creative writing prompts. All projects are related directly to each book and many are also subject to opinion to encourage students to support their initial statements. These tend to compare the events in this book to issues relevant to American culture today. There are also several creative writing prompts which ask students to write journal entries, newspaper articles, etc. 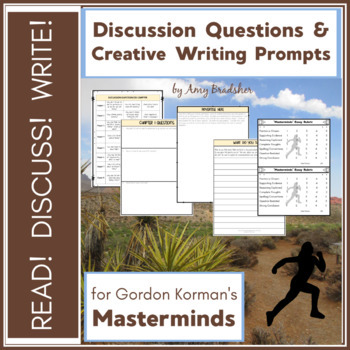 Writing prompts are written out on blank pages so that they can be printed and distributed, but they could also be written on the board or copied by students into assignment books. These products are suitable for upper-elementary and middle-grade classrooms, as well as homeschools, book clubs, literature circles, and co-ops.